There is no right or wrong way to take part. Go out into your school grounds during the month of May and use them as you'd like. Consider taking academic lessons into your grounds, promoting play outside, camping out in your schoolyard or inviting parents to the school to watch a play outdoors—whatever works best for your school. 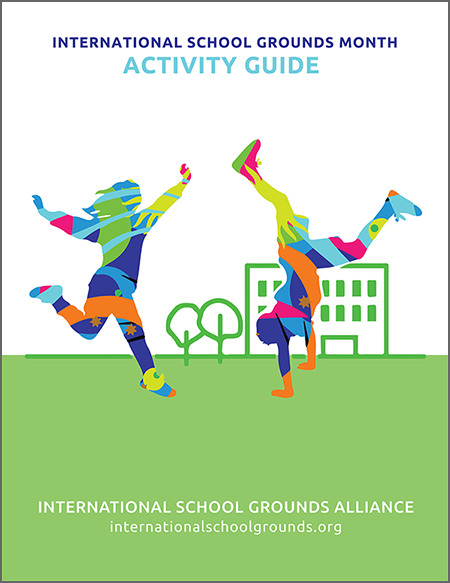 The 2018 International School Grounds Month Activity Guide is the result of a fruitful collaboration between the International School Grounds Alliance and 73 other organizations from 27 countries around the world, who each contributed a school ground activity that reflects their own organization’s mission, programs and areas of expertise. Our goal is to help schools around the world bring children, ages 3-18 years old, outdoors for all types of activities during the month of May—and year-round. We update and expand the International School Grounds Month Activity Guide regularly. It now includes a vibrant collection of 104 exciting ideas that support learning across the curriculum, promote healthy lifestyles, and encourage play and exploration during free time, before, during, and after school. Many of the activities also help children and youth connect to their neighborhood’s unique natural, geographic, and cultural context, and add art and natural beauty to their school ground environments. Click on the Activity Guide cover image above to download your free digital copy of this publication. The International School Grounds Month Activity Guide is part of a set! We hope you will also download and enjoy the companion Living Schoolyard Activity Guide, produced in the same format by our colleagues at Green Schoolyards America. The Living Schoolyard Activity Guide includes an additional 131 activities written by 122 organizations working across the United States. Both publications in this set are intended to be used anywhere in the world. Together the two books offer a total of 235 outdoor activities for children and youth ages 3-18, written by 187 collaborating organizations in 27 countries! The International School Grounds Month Activity Guide is also available in additional languages! Click on the book covers below to download your copy in Czech or Chinese! We hope these ideas inspire you to engage in outdoor activities at your own school, wherever you live—during International School Grounds Month in May, and throughout the year. After you have participated in International School Grounds Month in May, please share your school ground adventures with us by registering your school and telling us your story, using the form below. We are very interested in hearing from you! Following the event, we will share many of the activity reports we receive by posting them on our blog and social networks. Thank you! Click here to watch our new video celebrating International school grounds month around the world! The video was produced by Nadace Proměny Karla Komárka with participation from many of ISGA's Leadership Council Members. Click on the book covers below to download these free publications! Would you like a school ground Activity Guide in another language? We are very happy to announce that the International School Grounds Month Activity Guide is now available in Czech and Chinese! Click the covers below to download your own copy. The Czech language edition was translated by the Karel Komárek Proměny Foundation, from the Czech Republic (2018). The Chinese language edition was translated by Dr. Ching-Fen Yang, from Taiwan (2015). The Activity Guide set is the result of a fruitful collaboration between the International School Grounds Alliance, Green Schoolyards America, and 187 other organizations around the world, who each contributed a school ground activity that reflects their own organization’s mission, programs, and areas of expertise. The diversity of ideas they shared will now enrich school ground programs around the globe. We greatly appreciate everyone’s participation and extend our sincere and heartfelt thanks to this wonderful community of colleagues. 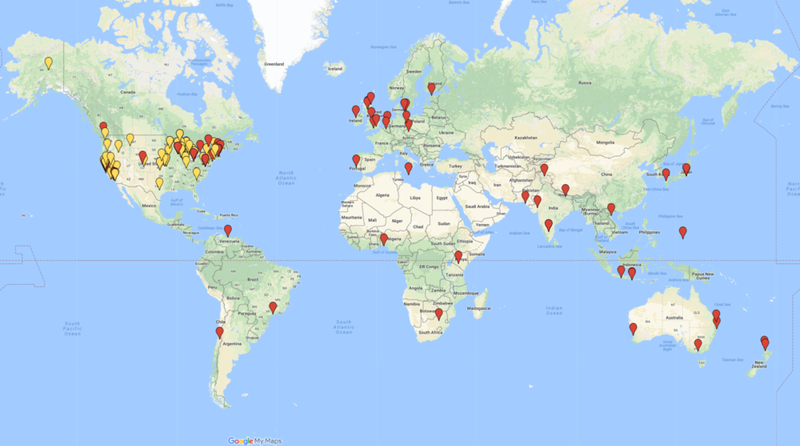 The maps to the right and below show the fantastic geographic diversity of the author-organizations that contributed activity ideas to this publication series. Organizations that contributed to the Living Schoolyard Activity Guide are shown with yellow markers. Organizations that contributed to the International School Grounds Month Activity Guide are shown with red markers. This is truly a global movement!